KPI Data is rarely just numbers. When analysing your KPI data for trends, you often have to analyse the smaller parts of the data to make sense of the overarching trends you see in front of you. Grouping your KPI data into categories lets you see these important details, and how your data is broken down. When visualising these categorical KPIs, the charts which you use all show data differently. This article will show you why categorizing data will make your data more powerful, and how to use different KPI charts, such as pie charts, to get different insights from them. Usually, Key Performance Indicators are measured as numerical values at regular intervals. Each value can then be compared to previous time periods to see a trend in the information, like this. But, you can get much more useful information from these time-based charts by dividing the values of the KPIs into different groups, or categories. KPI Categories show the different parts that your KPI data is constructed from, and lets you make better decisions by seeing your data from a different perspective. Let’s take a look at this data table, which shows sales data taken every month. 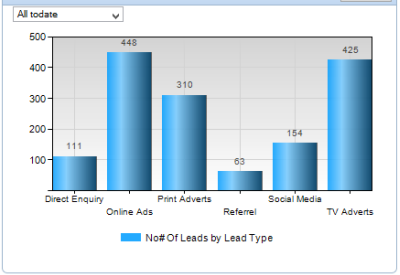 Taken as it is, this data only shows the overall sales figure, and how that figure changes every month. 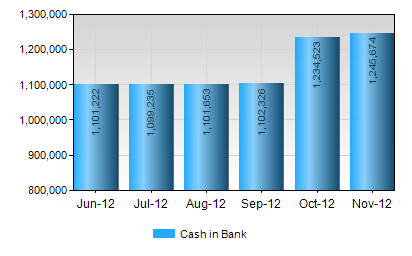 This chart shows that sales are increasing every month, and things are looking up! However, this chart hides information which does require action. 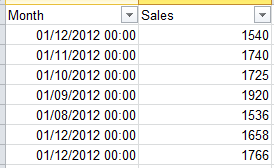 Here is the same information categorized in a table by the sales people which made the sales. You can see immediately how much more detailed this categorical data is. What’s more, putting this grouped information into chart form reveals additional trends which can totally differ from the original. 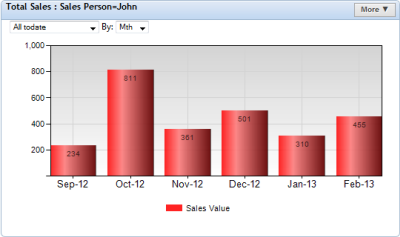 Let’s just see one of our salespeople John’s sales data over the past 12 months. 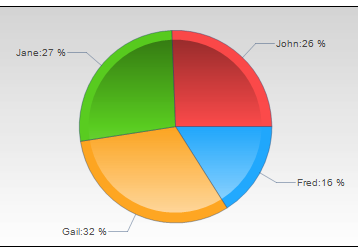 This data goes against the overall sales figures trend, showing us that John’s sales have been decreasing recently, requiring his manager to take action. If our data hadn’t been broken down into categorical data, we would have missed this important piece of information. By breaking down your time-based data into different categories, it becomes a far more useful tool for taking action and making good decisions. 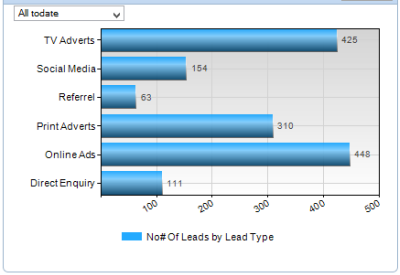 As we’ve just seen, visualising your KPIs makes your data easy to get useful information from. There are many ways you can use visualisations to get the business information you need, but the best visualisation for the situation depends on how whether you want to present time-based or category-based chart. As your data has already been separated into categories, showing the data from each category item together allows you to do two important things. Though there are many chart types to do either of these, I find that the most basic charts are usually the best. 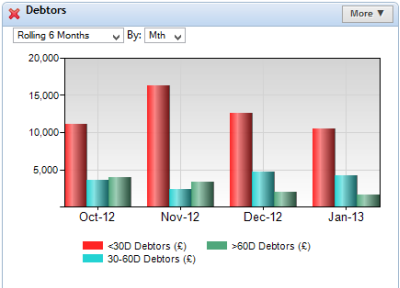 For comparing values in different KPIs over time, try using column charts. The Grouped Column chart allows direct comparison between different KPIs values (Ioannis, The History of Histograms, 2003). The adjacent columns let users easily see the values which occur in the same time interval, and therefore easily make comparisons between each category. Another option would be to use stacked columns, but the values can be inaccurately read this way. 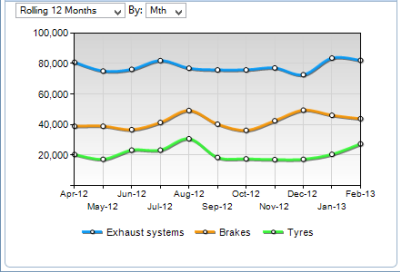 For comparing trend information, multiple line graphs allow you to see each category item in the same space. When showing trend information from categorical data, I find that line charts work better than area charts, as the trend line is slightly easier to follow this way. While categorical data items can be compared alongside each other to spot trends in a time-based chart, they can also be displayed in a category chart. Category charts display the different categories in a data set along one of the chart’s axis, so that the values can be easily compared to each other to measure performance. Category charts usually group together all values (taken at regular time intervals) into one value per category, which is displayed. This hides how the data progresses through time. To see this, you should use a time-based chart. Like time based charts, each categorical chart type has a different use. Here is a small selection of three chart types. The classic pie chart is one of the most common graphs for grouping data, and is brilliant at one thing: showing the relationship between a category item and the whole set of data. The different segments of a pie are optimised for this (due to the circular shape), but aren’t great for comparing the sizes of category items. Except for the x-axis not displaying time, this looks identical to the previously described column chart for time based data. This is great for comparing values of category items, but not how they relate to a whole. TIP: If you have more than one category (e.g. salespeople and products sold) in your data, you can filter out different items from the second category to get a different perspective on your data. Bar charts are essentially column charts displayed horizontally. These have much of the same advantages as column charts, but the fact that they extend along the x-axis means that it’s easier to read the value differences of items that have been lined up largest to smallest. So, if you have data where you wish to know the exact difference of category items, bar charts are a great choice. There are also some slight variations to bar charts which you can discover in our Visual Dashboard Database. Use categorical data to dig deeper into your KPIs! By splitting your data into categories, you can uncover how overall trends are made up, and spot previously hidden information. By visualising this data as either time-based or category charts, you can get all the information you need to make great decisions quickly. To see how categorical data can help you analyse your own KPIs, just log into your Target Dashboard account and experiment with grouping data. If you don’t have one, sign up for a free demonstration now!